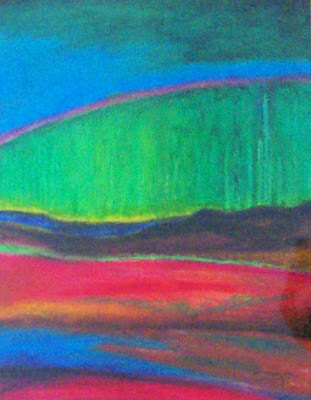 Maybe I should revisit oil pastels. I didn't do much in this style after this landscape I call, Red Earth. I wonder why. Oh wait, it really hurts my hands - all that rubbing the color into the tooth of the paper. Wrong type of paper? Or pastel sticks? I dunno. Worth researching, though (this is where an education in art would probably have been handy, I guess). In any case, it turned out very intensely colored (although the photograph is terrible, I know), and I did enjoy doing it!